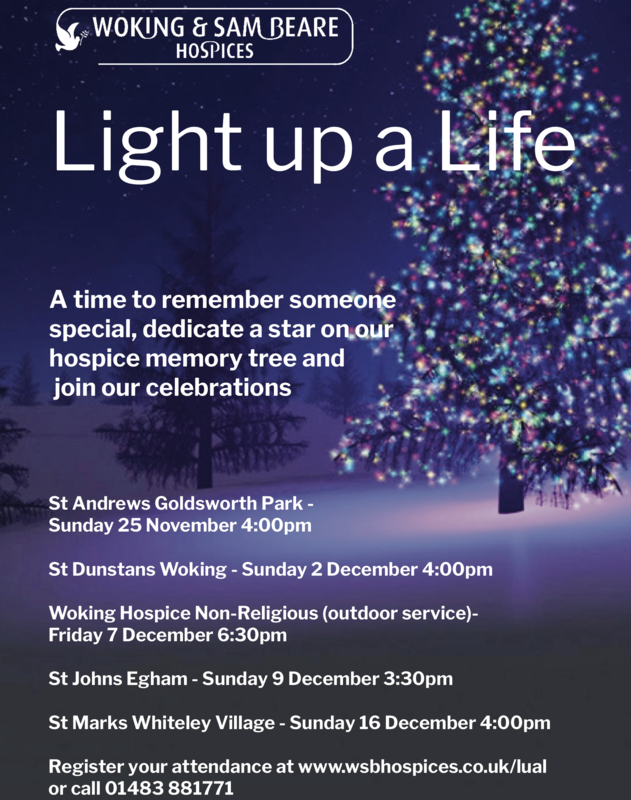 Woking and Sam Beare Hospices are extending an invitation to remember someone special – join their celebrations and dedicate a star on the hospice memory tree. Join us this Christmas, as our community comes together to celebrate the lives of loved ones who are no longer with us by attending one of our Light up a Life celebrations. This is a wonderful vibrant time of the year where we gather together and look back on the lives of those who were the closest to us and the joy they brought into our lives. Our Light up a Life services not only pay tribute to those no longer with us, but also celebrate the unique hospice care that our patients and their families receive. At this time many people help by making a gift in memory to Woking & Sam Beare Hospices,” says Jean Wharton, Individual Donations Fundraiser at Woking and Sam Beare Hospice. You can read Malcolm and Jean’s account in our latest leaflet of how the hospice cared for their daughter, Kathryn, why they attend a Light up a Life service around the Christmas season and how you can help others like their family get the support needed during these difficult times. Your support really can make a difference. Any gift enables us to continue to deliver our care and support across North West Surrey, funding our Community Teams, our 20 bedrooms on the Ward and Bradbury Wellbeing Centre. We are a charity and over 80% of our income comes from generous supporters like yourself and we hope you will consider giving a gift today.